Summary of the Trituration on June 16-17, 2007 in Millarville, AB. The buffalo gently led us into a very safe space, where we felt protected, like the buffalo calf would feel protected by its strong mother and both would be protected within the herd. Even though the buffalo represents great power and strength, it was amazing how gentle and peaceful its energetic presence felt. A marked sadness showed up, sadness from looking and witnessing all the man-created imbalance and struggle in the world. We received messages that the buffalo plays a major role in supporting groups which work on the restoration of balance on planet Earth. In that way it holds the truth of the relationship between humans and Grandmother Earth on the collective level. It supports those who dare to resist to storm of destruction. Within the collective the buffalo takes care that each individual is honoured. He makes us aware of the “equality and the uniqueness of each individual”. “Sin, within the energy of the buffalo, would be not respecting the individuality of each single one”. The participants were highly sensitive to disrespect. Five of the seven experienced anger, one to the degree of rage. In all cases the anger was triggered when they felt treated disrespectfully. By using their anger, they tried to restore the safe space within their personal boundaries, as the buffalo would raise its tail to caution intruders. Yet it has to be admitted that the buffalo is far more effective in handling this issue, as he deals with it in the moment and then the problem is over, whereas we unforgivingly carry grudges with us for months! In the Lakota story of the White Buffalo Calf Woman we recognize the same traits. The gentle White Buffalo Calf Woman was approached by a warrior in an indecent way. Without warning she turns into a storm cloud and when the cloud was gone only the bones of the disrespectful man were left. Right away Buffalo Calf Woman again showed herself in the peaceful, gentle and giving aspect of herself. The buffalo was very unimpressed from mental constructions, theories and rhetorics: “No nonsense!” was its message. Buffalo energy holds the core of family and community as it harmoniously balances the apparent conflict between individual dignity and the collective. The specific vulnerability of every member has to be acknowledged and respected. The participants were deeply touched seeing this vulnerability showing up in themselves. 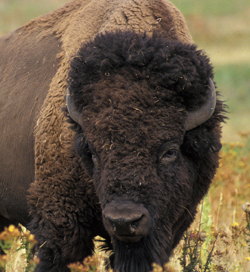 Even the strong buffalo showed its vulnerability through the fact that it almost went extinct. Everyone involved could see the beauty behind this vulnerability, which by no means has anything to do with weakness but rather is an attribute of everything on this planet which has worth and value. This understanding was possible not through a mental process but through an opening of the heart. With our own heart being opened and with a close connection to the land and to Earth herself that the buffalo provided us with, we could now feel with the heart of Grandmother Earth. Again we experienced the deep sadness about the imbalance globally inflicted on nature.